Now in its fifth year, the show is proving more popular than ever with Sky Arts viewers, despite the departure of the lovable host Frank Skinner. Taking his place on screen in this year’s production is acclaimed actor, Stephen Mangen, who co-hosts with Joan Bakewell. The feel-good TV show celebrates amateur landscape artists from across the country. Some might say the show is the art equivalent of the Great British Bake Off, whereby the contestants take part in several heats, in various idyllic locations throughout the UK, to reach the finals. This year, filming for the competition began in North Yorkshire on 19th June for the first two heats. The film crew then headed south to the Kentish seaside town of Broadstairs on 26th and 27th June, where Allspan were the temporary structure supplier for the second round. It was then back up north to Ineraray Castle, Argyll in Scotland for the final heat on the 10th and 11th July. The worthy winner, who has not yet been announced, will win a £10,000 commission for a British Institution’s permanent collection and £500 of art materials. Take a look at this short clip for a taster of the new season and check out the film crew marquees on the beach. For the Kent filming of Landscape Artist of the Year, Allspan installed two 6m x 6m ‘A’ Frame PVC marquees. The two TV production marquees were installed prior to filming at two separate locations along the seafront – one at Broadstairs’ harbour arm and the other on the beach. Event flooring was used on top of ground mats to provide an even footing on both the sandy beach and hard standing harbour arm. The marquees were used by the production crew for a variety of purposes during the two day filming process. 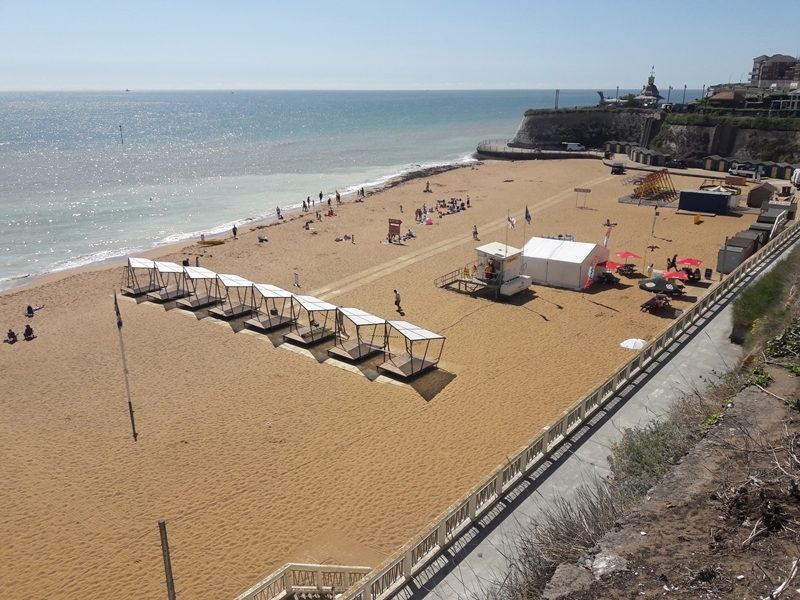 Broadstairs is one of Kent’s most significant filming hot spots for a variety of TV shows, music videos, ads and films, thanks to its variety of modern and historic architecture and long stretches of sandy beaches. Recently another popular TV show, ‘Julie, Naked’, starring Ethan Hawke and Chris O’Dowd, chose this very spot for filming on location as well. For Sky Arts Landscape Artist of the Year, the Kent beach was the key focus for the artists. The gorgeous summer weather further enhanced this beautiful setting, but in previous years the gods have not been quite so kind. Fortunately, Allspan’s marquees and structures are suitable for all climates, come rain or shine. On this occasion, they offered sanctuary from the hot sun for the crew and provided shade for essential equipment. Allspan temporary structures and PVC marquees can be installed in many different locations for TV and film productions. From sandy or stone beaches to car parks and city centres. The size can be altered to fit the requirements of any film crew working on location. Even the wall panels, flooring, roof and interior can be styled as needed. Allspan temporary structures and PVC marquees are maintained and installed to the highest possible standard. After every event, the structures are cleaned and assessed. This attention to detail is the very reason our structures are used for TV and film production. Whether an Allspan structure is featured in the filming process or simply as a convenient shelter on location, the presentation will be impeccable. To find out more about Allspan’s temporary structures and film crew marquee hire services, for filming on location for TV and film, please get in touch. We can provide temporary structure hire for all types of events; TV, film, corporate functions and private parties throughout the South East, including Kent, London, Surrey, Sussex, Berkshire and Hertfordshire. If you have a project that requires a contemporary and stylish structure, we would love to hear from you!